Heads up Extreme Sporters we have an amazing article for you today. 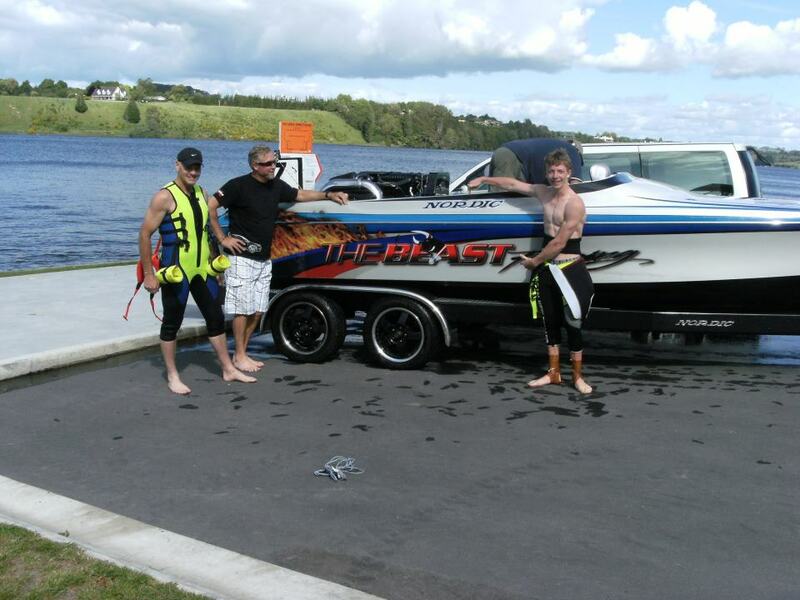 We have been talking to award winning New Zealand drag water ski racer Mitchell Horan. He kindly agreed to give us an interview, that you won’t want to miss! Q. Can you tell us a little bit about drag water-skiing? A. Drag Water-skiing racing is an extreme sport where you ski on a specific single ski that is designed to race at high speeds. I ski on a DC ski designed by Danny Cropper from Australia. 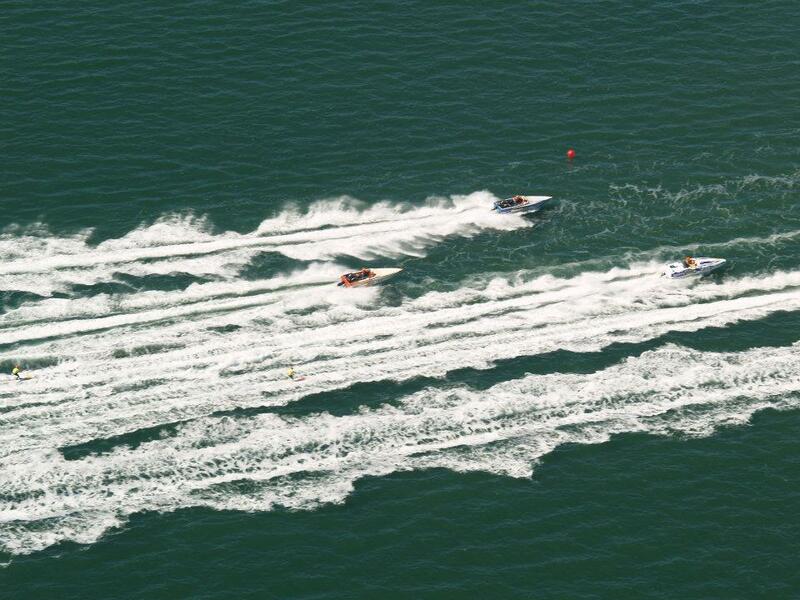 Drag Water-skiing is not a large sport in New Zealand but has a big following in Australia and America. Racing either takes place in pairs (called two up) or you single ski. Here in New Zealand we are fortunate to have great water ways and our series races take place both in our rivers and lakes, as well as on the ocean. There is an array of events that I participate in and they range from the circuit series which sees my family travel with me throughout New Zealand competing and a couple of special river races. This year with my team; Driver Colin Eagles (cousin) and Observer Jack Horan (father) I have reached speeds over 102 mph while racing. It takes a huge amount of focus to be able to stay on the ski at that speed and an even greater amount of strength to be able to withstand the pull of the boat at my age. This is hard on both my arms and my legs. Most circuit races are for 20 minutes plus one lap and the river races can be up to 52kms in length one way, then a return journey of about half that distance. We also have lake races called the “hundy’ and “fifty” which is exactly what they are – one hundred miles in length and fifty miles in length. I am currently training to compete in the “hundy” in March 2012. 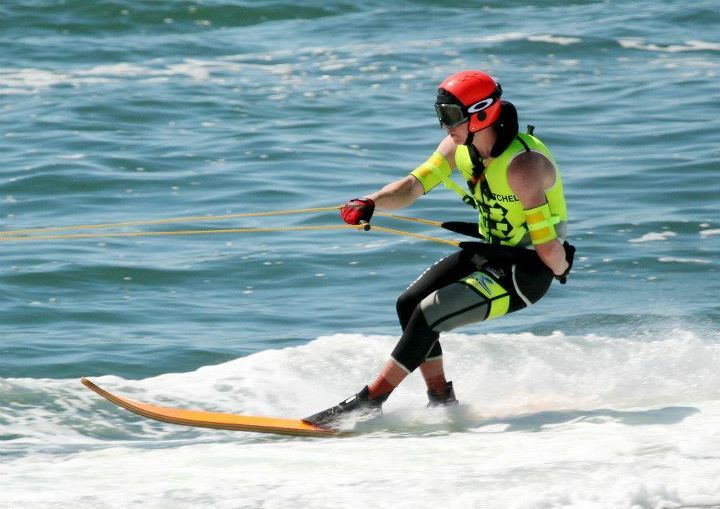 Because of the high speeds involved with the sport it is paramount that all safety gear is worn, this includes a helmet, neck brace, arm restraints and goggles and an especially designed wetsuit with buoyancy already inserted in the design. I also need to ensure I have spare equipment in the boat such as ski ropes and goggles just in case they are needed. Prior to racing I tape my ankles just to ensure they are well supported because at times the water is extremely rough. In order to be competitive I have to train a lot and I have a training schedule that I work with my Dad on. Dad is a former World Championship and Olympic oarsman and he trains me pretty hard. Mostly I do steep hill running and gym work but in preparation for the next World Championship selections in 2013 I am focussing on endurance cycling to build up my leg strength. For pleasure and training I slalom ski and plank ski (which is just water-skiing on a fence paling without a binding or fin) – it is great for balance. Oh yeah, I should add I also love uni-cycling which is also great for the balance. Q. How long have you been participating in the sport? A. I first got into this sport through going to Ski School Christmas 2008 when I was 11 years old. I have just turned 16 and this will be my fourth year of competitive drag-ski racing. I grew up at the coast in Tauranga New Zealand and my parents had an all-purpose boat that I learnt to biscuit and double ski behind. At Ski School I got the opportunity to have a go on a drag ski and from there I was hooked. The all-purpose boat got sold and our first race boat Bad Jelly a 1750 bullet with a 250hp Mercury was purchased. Eighteen months later that boat was sold and Mum and Dad bought a 19Ft Sonic with a 300hp Yamaha on the back which has an F2 rating. This is now my training boat although I do ski in the F2 races behind it in the circuit series. While at the World Champs in Brisbane last year Colin purchased “The Beast” which is a Nordic brand boat design built in the USA with twin superchargers producing 1075hp and I now race behind that. It is a world class proven rig having towed World Champion woman Formula 1 Kaitlin Wendt from the USA to victory twice at the World Championships. Q. We hear you have participated in and won some amazing races this year, would you like to tell us a bit more about these? A. Yes, 2011 has been an amazing year for me. My highlights have been representing New Zealand Junior Boys at the World Championships in Brisbane Australia in September and winning the prestigious Hamilton Bridge to Bridge race held in New Zealand in December. Getting selected for the World Champs was really difficult. I put my name forward for selection but really was the underdog of ski racing within the New Zealand junior boy category. I knew I was capable but the boat I was skiing behind wasn’t as fast as my competitors and this put me at a disadvantage, however, I turned this around to a challenge that I needed to beat. My Dad helped me focus on my training and I began to ski behind Colin’s other boat “Hoofit” which really took me out of my comfort zone and helped me develop as a skier. I also started skiing “two up” with Dwight Dutton and his experience began to rub off on me. Hours of training together on the sea at Tauranga put me in good stead. The team was announced and I was selected to ski Mens F2 but was then repositioned back into the Junior Team. I was badly injured prior to the Worlds at a pre-worlds selection race in Brisbane. I ended up in hospital with a broken jaw and fractured skull after a fall. That aside I was back up and on a ski within a month and ready to go. I was so fortunate to have Pat Cole (Aus) as my driver and Rory Brown (Aus) as my observer from Sydney as my team for the Worlds. Rory a world class skier himself and Pat a world class driver was more than I could ever have dreamed. They taught me so much and I will be for ever grateful to them for the time they spent with me. Without their focus and advice I doubt that I would have achieved what I have to date. I gained fourth place overall in the junior boys and bought home a silver medal with fellow New Zealand female junior skier Columbia Cox from Wellington. The Bridge to Bridge is the largest race in New Zealand attracting skiers from Australia to win the coveted title. My goal was to win the under 19yrs category and break the record, however all the NZ juniors had already paired up which meant if I was going to do this I would need to find another skier from somewhere else to ski with me. I approached Wil Groves (16 years old) from Victoria Australia. Wil and his father Brad came over for the event. We only had one practise race prior to the event and we were skiing behind “The Beast”, which is the largest F1 Superclass Boat in New Zealand. Wil had heaps of experience behind fast boats but I hadn’t so I was mindful that I was the weakest link in the team. Colin was driving and Dad was observing and I knew that Dad would keep me safe. The key is not to miss your start and Dad knew not to overwork the skiers on the first leg and tire us but save some of the energy for the fast burst home and that is what we did. We had a bit of luck on our side as well with other top boats either breaking down or skiers missing their starts. People spend their whole lives trying to win this race and I did this at 15 years of age……I still can’t believe it. Wil and I were the first under 19yrs team to win this race in 12 years …and yes we won the under 19yrs category. I am hoping this achievement will help gain some sponsorship to help with my future. A. My goal is to complete the circuit series and be on the podium as well as get placing’s at both the North Island Champs and Nationals. My long term goal is to be selected to represent New Zealand at the World Championships in 2013 – venue yet to be announced but more than likely to be Las Vegas California. I also have a couple of younger skiers that I want to get along side to help mentor. It is important always to give something back and I will begin observing for Ethan Wilson who is an up and coming New Zealand sub-junior skier once I have my observers licence. I also now need to seriously plan for my long term participation in the sport and this includes getting a sponsor that can see benefit to their business by aligning themselves with me and my values and successes. It is highly likely there will always be a ski in the garage most of my life. Q. Do you have any recommendations for other people your age who might want to get into the sport? A. Go to Ski School if there is one available. You have to be committed to train even when you don’t want to. Time on the water makes all the difference and practice, practice, practice. My biggest piece of advice is find a team and stick together. The driver and observer are equally as important as you the skier. You have to have high trust in each other. Sometimes things don’t go well and you as a team have to be able to take that on the chin. It isn’t always an easy journey when you want to be successful. Before you set your goals you need to be realistic that not everyone will want you to succeed the way you do and that you need good people around you to help keep you focussed and motivated when things don’t go well or as planned. I am lucky I have my Dad and Colin as well as his step son skier Dwight who lives with us. We spend hours talking about the sport, watching all the World Champs DVDs, You Tube footage and making our own video clips which I am sure contributes to my motivation and success. Drag skiing is a way of life….not just a sport. 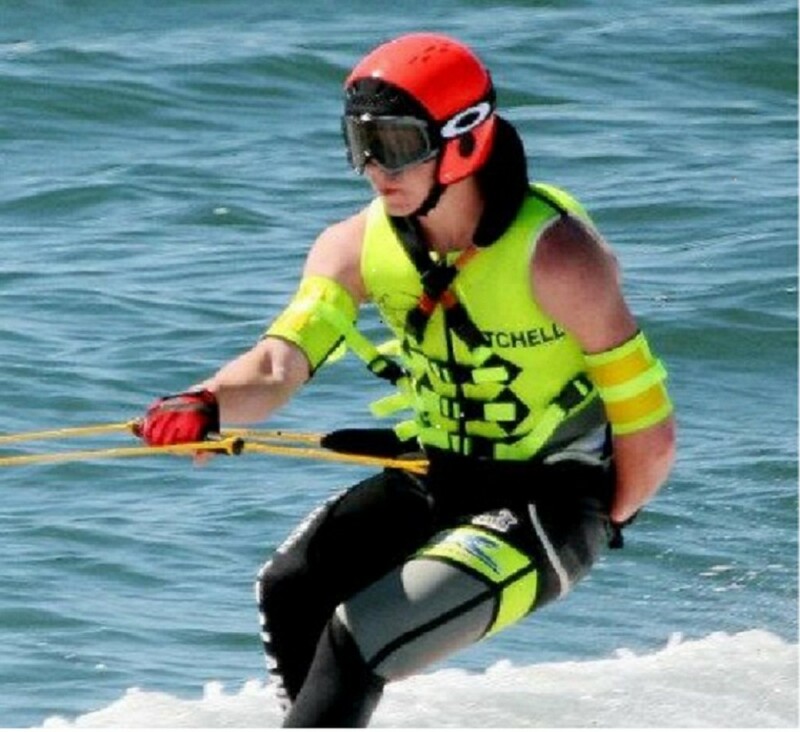 Mitchell is supported by NZWSRA (the New Zealand Water Ski Racing Association). 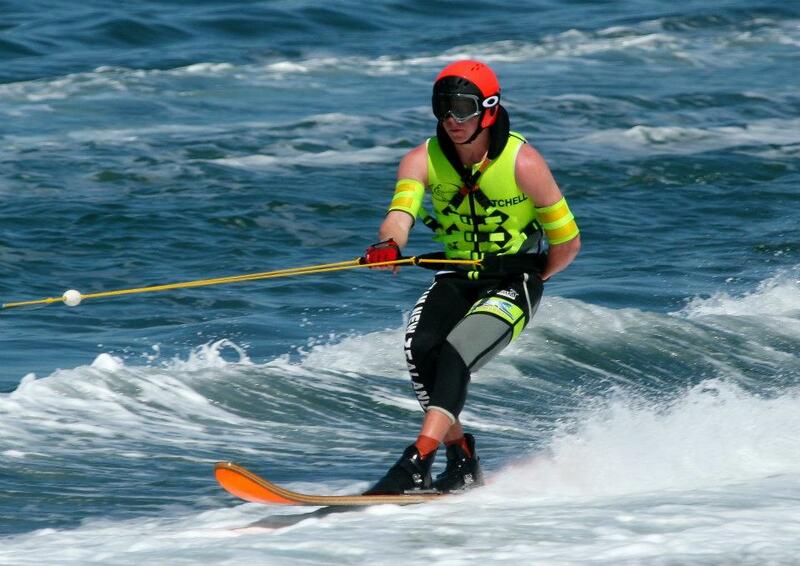 This entry was posted in Featured, Water Sports and tagged Drag Water Ski Racing, Mitchell Horan, New Zealand. Bookmark the permalink.